Night Vision Range: 600ft. Can see perfectly well at night as well as during the day, in fact, they have even sharper eyesight than humans with perfect vision. Deep Vision All Septumbrans can naturally see the invisible, including Entities, Astral Beings, and Astral Travelers. Furthermore, they can also see those using the Shadowmeld spell or ability, as well as those using the Chameleon spell (or any equivalent.) They can see right through conventional use of camouflage and similar abilities, which means that skills such as Blend and Camouflage suffer a -30% penalty when under the eye of a Witch Wolf. Bio-Regeneration Regens Hit Points at a rate of 1D4 per hour, and S.D.C. at a rate of 1D6 per hour. Prehensile Tail A Witch Wolf’s reptilian, furred tail is long and thick, reminiscent of an alligator’s. It is prehensile in the sense that it is used for balance (+10%, already applied), swimming, and to strike an opponent behind or to the sideof them. Excellent Sense of Smell Septumbran’s olfactory senses are much more powerful than that of a human, which also makes them great trackers. They can sense and follow scents up to 1 mile away (blood scents up to 2 miles), double that distance if the scent is carried by the wind. P.P.E. Recovery, P.P.E. Supplementation, and Meditation as Rest Recovers P.P.E. at a rate of 5 points per hour of sleep or rest, or 10 points per hour of meditation (which is equal to an hour of sleep or rest for this character in regards to fatigue and physical rest.) Can also supplement P.P.E. from familiars, lesser supernatural beings under their command, from objects or portals/Rifts, or from willing sources such as other mages or elementals. Supplementation can also come in the form of a blood sacrifice, which doubles the P.P.E. gained, but is only used by evil Shifters. Note: Can be used during combat to sense if a dimension type spell is cast. Costs one melee action per round (up to 1 full minute in subsequent rounds/level.) A successful roll means they easily detect and locate any dimensional type spells used (including a Teleport, the opening of portals, etc.) for the duration of that round. Additionally, if the magic is detected, they can attempt to alter the course of the spell for the original cost of P.P.E. (it cannot be canceled, only shifted to change the location of a portal, where it leads to, close it prematurely, or to make it stay open longer.) This requires both casters to roll 1D20, high roll wins, and in the case of a tie, the defender wins. If the attempt is unsuccessful, the Shifter still spends half the original cost of the spell in P.P.E. and does not alter it. Dimensional Travel (125+ P.P.E.) A Shifter’s most powerful ability is to open a dimensional gateway. At the base cost of 125 P.P.E., they summon a one-way portal large enough only for themselves and their familiar. Each additional person they allow through costs 25 P.P.E. more, the portal will remain open for 1 minute (4 rounds) at most, and the cost must be paid up front. As many as 5 beings can pass through the portal per round (so long as they don’t waste time), and the caster cannot designate specific beings as having access (a stowaway could leap through and prevent another entry, for example, but only if the Shifter is restrained or unable to enter the portal.) The portal can target the caster’s home dimension and random dimensions, or any dimension which the caster has visited. To open a Rift on the same world, the cost is halved, but only possible if the Shifter has been to the location before or opens a Communication Rift there first (typically they appear on a nearby ley line or nexus point.) On a smaller scale, the Shifter can open a portal from a ley line to any connecting point on a ley line even if they have never traveled there before. Communication Rift (50+ P.P.E.) They can open a micro-Rift, just small enough to send a message or a small animal familiar through (this is typically how a Shifter contacts an Alien Intelligence.) The portal is pretty stable and about the size of a grapefruit (if opened on a nexus point, the caster risks an Alien Intelligence gaining control and making it larger, or possibly the natural events such as the ebb and flow of the ley lines forcing the micro-Rift into a full blown dimensional gateway between the worlds.) Cost: 50 P.P.E. on or within a half mile of a nexus point, 100 P.P.E. on or within a half mile of a ley line, and 200 P.P.E. anywhere else away from ley lines. Duration: 1 minute (4 rounds) per caster level, and only the Shifter can close the connection (though those on the other end can walk away.) Success Ratio: 47% +5%/lvl to open the portal exactly where wanted. If done as a ritual (takes 1D6×10+15 minutes), a +20% bonus is applied. The time it takes to open the portal without a ritual is 1D4 melee rounds of meditation and concentration. A roll of complete success indicates complete control over where and when (it can transcend time, space, and dimensions) the portal appears and total clarity of speech as though the Shifter were standing right there. A failed roll within 20% of the success ratio indicates that the portal to the right continent, world, or dimension, but not the right person, and so must dispatch a familiar or spell (like Magic Pidgeon or Distant Voice) through to carry the message the rest of the way. Familiars must return before the micro-Rift closes or else be trapped in some other place or time; if this happens, the Shifter must open another micro-Rift or true dimensional portal to the familiar’s location within 48 hours or suffer the usual consequences of having lost a familiar. Dimesional Teleport Home (75 P.P.E.) They are so attuned to dimensional nuances that they can always find their way home, though this only applies to the Shifter, their familiar, and any gear they can carry.If the P.P.E. is available, this can be used to get the caster home in 1 melee action (4 seconds). Special Endurance: Both the Shifter and the familiar gain 6 HP, as well as +1 to any saves vs. poison, mind control, and possession. However, if either are hurt, they feel each other’s pain as if it were their own. If the familiar is killed, dies, or is permanently lost, the Shifter permanently loses 10 HP and has a 01-50% chance of suffering a shock and going into a coma that lasts 1D6 hours. The Shifter then cannot link to another familiar for 1 year after losing the linked animal. Summoning Arguably a Shifter’s greatest power, they can communicate with and manipulate inhuman creatures (demons, Deevils, Daemonix, Gargoyles, Brodkill, the undead, and other supernatural beings.) The caster will have an easier time if of a similar evil or anarchist alignment to the summoned creature, to help them work together better (the more wicked and evil the Shifter is, the more loyal the demons and such will be to them, especially if the creature is allowed to engage in their own evil acts.) It is second nature for them to call upon a creature via a Rift to do their bidding, though the being is more likely to cooperate if sent on a mission they will enjoy. These creatures may be called on a needed basis for missions, or even develop a comradeship with and recalled multiple times like a hired hand. The summoning is accomplished through use of a Communication Rift and probing of dimensions until they make contact with a lesser supernatural being. Round One: Once contact is made, the caster and being are entered in a battle of wills. To save vs. submission, the creature must roll a 1D20 above the Shifter’s M.A. attribute 3 out of 5 times (any bonuses the creature may have from a high M.E. or save vs. mind control are applied and a natural roll of 20 is always a saving roll, regardless of the Shifter’s M.A. score.) If it fails to save, the creature becomes totally subservient and obeys any command except to reveal its true name or to commit suicide. If the creature successfully saves, it is agitated and hostile, and can use the micro-Rift to open the portal further to the Shifter’s location, even if it does not have dimensional travel abilities. The only way to stop this is to close the Communication Rift before the creature comes through, and as a rule, the creature typically indicates its anger and tips off the Shifter. If they make the first move and step through, the creature appears immediately in front of the Shifter. If both move at the same time, initiative is rolled and the higher roll wins. Round Two: If the creature steps through and thinks it’s stronger than the Shifter, it is likely to attack. If the Shifter proves to be stronger, it is likely to surrender and flee, just happy to have escaped into this new world. However, a physical battle offers another chance to seize control of the creature. If the Shifter wins the fight, they can negotiate with the creature, offering to spare its life for a certain length of service, until a particular task is accomplished, or even until a certain event takes place (the last two options are especially useful because they don’t sound like they will take too long to the creature and most supernatural creatures are arrogant and assume they will finish the task quickly only to end up in servitude for decades.) Demons and other such creatures are used to being bullied and value their lives, so will typically willingly make a deal to spare their own life; the deal is signed of a personal mark in the creature’s blood, on any surface, paper, or even the creature’s skin. Once the deal is signed, even if the contract is destroyed, lost, or washed away, the creature must still fulfill its terms. Note: The creature must be the attacker for the pact to apply, otherwise it is considered the victim and any contract is void. Limitations and Conditions of a Pact: The shorter length of servitude, the better, as the creature could become bored or even grow to hate its master (unless the creature is of a similar alignment and enjoys the missions, then it may even decide to stay as a partner or henchman when its time is up.) Only 1 lesser supernatural being can be controlled through a Shifter’s battle of wills at level 1, +1 additional being at levels 3, 5, 7, 9, 11, 13, and 15. 2 sub-demons or imp-like minor creatures, poltergeist, or haunting entities count as 1 lesser supernatural being, while 1 greater demon or undead counts as 2 lesser beings. Even more creatures can be summoned and attempted to control, but they have a greater chance of denying the Shifter’s influence (and more can be controlled through a signed pact.) See page 124 of RUE for additional advice on dealings with demons and other supernatural, evil creatures. Link to the Supernatural: Demon Lord: Manohshek the Devourer Manohshek typically ties theirself to minions who are not above consuming the flesh and sacrificing of other mortals, which they akin to worship – cannibalism is a particular joy of theirs, but any flesh eating/sacrifice can be rewarded. The agenda of a Demon lord is always to create chaos and discord within the world, though they may also seek to thwart a rival or gain worshippers. They test the Shifter by demanding a blood sacrifice. Applied Bonuses: +1D6×10 to P.P.E., +1D4×10 to S.D.C., +3 to Save Vs. Horror Factor, +1 to spell strength, and +1 to Save Vs. Magic. The Shifter may also summon a Lesser Demon once every 24 hours that will obey their commands and stay by their side for 1 hour per level of experience. An alternative is that the demon may be sent away on a mission lasting 1 day per level of experience (during this time, no additional demons may be summoned until the initial one returns or is announced to be dead by the Demon Lord.) If the demon is slain while on a mission, the Demon Lord will complain (though they couldn’t care less) and will forbid any other demon summoning for 1D6 weeks. The only exception is if this mission has furthered the Lord’s agenda or if they found the demise or quest amusing. Penalties: Once the link has been established for a year, the Demon Lord has gained significant control over the Shifter and can punish them at will once per week via the Agony spell. This is used sparingly, typically only when the Shifter tries to openly defy their benefactor. Javelin 2D6 S.D.C., 3ft long, sharpened metal pole, used primarily to dispell illusions. Damage: 4D6 S.D. per single round or 1D4×10 per 3 shot burst. Payload: 20 per e-clip, cannot use long e-clip (×6 extra e-clips). Patchwork Armour Covers 30% of the body, 36 M.D.C.
Wastelander Motorcycle Crew: 1 rider, plus large storage compartment. Speed: 120 mph. Engine: Combustion. Maximum Range: 400 miles. Size: 9ft long, 800 lbs. Main Body: 60 M.D.C. Tires: 2 M.D.C. each. Weapons: None (Can be purchased.) Familiar rides on them, in pack or the storage unit. Borrowed Ash Pouch A small leather pouch filled with collected remains of their cremated ancestors. It is considered lucky and sacred, and so long as they have it on their person they recieve the following bonuses (does not apply to any except the original owner of the pouch, carrying additional pouches have no added effects); +2 to Save Vs. Magic/Poison/Disease and +10% to Save Vs. Coma/Death. If the bag is destroyed or lost, it is considered bad luck and brings a curse upon their family for at least one year. Black Market Items 8000 credits worth. Calling (8) Range: 2 miles per level. Duration: 5 minutes (20 melee rounds) per level. Saving Throw: Standard. A limited form of telepathic communication with which the caster can mentally call a specific individual. To make the call, the mage must know the person’s first and last name and have personally met them before (even if briefly.) The call sends a telepathic message which appears in the recipient’s mind with their name (for example, “Kevin Siembieda, I need your help”) and a general impression of where the sender is located. Only the recipient can hear the call. If the saving throw is successful, the message and impression is only heard once. If the save is not successful, the message is repeated over and over again, 3 times per melee round, compelling the recipient to answer, until either the duration ends or the reciever goes to the caster. Only a Mind Block can completely block out a call. Call Lightning (15) Range: 300ft, line of sight. Duration: Instant. Damage: 1D6 M.D.C. per level. Generates a lightning bolt that can be directed at any specific target within range. The bolt strikes from the sky (even indoors), and always hits the intended target so long as they are within the caster’s line of sight. Compulsion (20) Range: 60ft and within line of sight. Duration: 24 hours. Saving Throw: Standard. The spellcaster can implant a sudden desire or need in another character’s mind (the focus of the irresistible impulse should be reasonable and attainable.) The victim will be consumed with the object or action of the implanted compulsion, whether it is very simple (a candy bar craving, needing to visit someone, etc. ), or something more extravagant. The victim remains obsessed with the compulsion until either the duration ends or the need is met. A Remove Curse spell instantly negates the compulsion. Contain Being (20) Range: 30ft. Duration: 2 minutes (8 melee rounds) per level. Saving Throw: Standard. This invocation is useful for controlling lesser supernatural creatures (demons, Deevils, Daemonix, Gargoyles, Brodkill, minor elementals, the undead, etc. ), as well as forcing the being to obey the caster to a very limited degree. Mainly, the caster can hold the creature at bay with an order (“stay back”, “don’t move”, etc..) No commands more elaborate than this will be obeyed. The incantation works in much the same way that a cross can hold a vampire at bay; provided the caster and their companions stay out of reach of the being, the magic will keep it back. Any attack on the being breaks the containment, and if someone should be close enough to attack while contained, it almost certainly will do so. Non supernatural beings (Dragons, D-Bees, Fae Folk, mortal humans, aliens, etc. ), greater supernatural creatures, and possessing Entities are not affected by this spell. Dimensional Portal (1000) Range: 1 meter away. Duration: 30 seconds (2 melee rounds) per level if cast as a spell or 1 minute (4 melee rounds) per level if performed as a ritual. Opens a two-way door to another dimension, the mage can open this portal to a specific dimension, world, or location. This is the only way a greater supernatural being can enter into this dimension. Once the portal closes, the only way back is by entering or opening another portal. One of the major drawbacks of this spell is that something unwanted often manages to slip through. Also see O.C.C. Natural Abilities. Energy Field (10) Range: Self or others up to 60ft away. Duration: 1 minute (4 melee rounds) per level or until it is destroyed. The spell creates a magical force field that surrounds and protects the caster, others nearby, or an object. The maximum area of protection is 8ft., which means it could protect a small room full of 6-8 people. The energy field appears as a semi transparent wall or bubble that shimmers with a bluish white light. The field normally provides a barrier of protection worth 60 M.D.C., but this protection is doubled on a ley line and tripled on a nexus point. If the being fails both attempts at possesion roll percentile dice; 01%-52% and the creature is immediately returned to its home dimension, 53%-00% and the being can remain in this world, but must immediately flee the area and cannot return for at least 6 months. Note: Ritual exorcism has a greater chance for success, but also takes 20 minutes to prepare. Provided the caster has sufficient P.P.E., an exorcism can be repeated on the same host as many times as necessary. Repell Animals (7) Range: 30ft. Duration: Immediate. Saving Throw: Standard for animals. This enchantment will make even a hostile predator stop, turn, and leave the area without harming the caster or anyone near them. The animal will not return for hours. This enchantment can affect up to 6 different animals simultaneously. Re-Open Gateway (180) Range: 10ft. Duration: 15 seconds (1 melee round) per level. Enables the caster to reopen an already existing/active or permanent dimensional portal. This includes the dimensional portals found in stone pyramids, on nexus points, ley lines, or similar. The portal will automatically open to the last world/dimension location it led to. Once opened, anything (friend, foe, monster, etc.) can step through from either side by simply stepping into the swirling, blue vortex (thus, it is not wise to reopen a portal for very long, especially if the caster has no knowledge of where it leads.) The caster can close the portal within an intant and at will, but may need to roll initiative to see if anything nasty may have stepped through. Note that due to the nature of the spell, hose passing through from either side may only go one way. Also see O.C.C. Natural Abilities. Sense Magic (4) Range: 120ft. Duration: 2 minutes (8 melee rounds) per lvl. User can feel magic emanations and pinpoint their direction, source, and location by following them. Invisible, magical, or supernatural creatures/objects can only be tracked to a general area. Can also sense whether an item has magical properties, if a person/item is under a magic spell/enchantment, when magic is being used in range, and who is casting the spell. Does not sense psionic power. Trance (10) Range: Touch or within 12ft. Duration: 5 minutes (20 melee rounds) per level. Saving Throw: Standard. This enchantment places the targeted character into a zombie-like state in which the victim is in a hypnotic daze, unaware of their environment or the happenings around them (they cannot formulate thoughts, use skills, or take action on their own.) While entranced, the victim can only hear the caster’s voice and will obey, without resistance, simple commands (sit, stay, follow me, say “hello”, lie down, jump, etc. ), but cannot engage in combat or perform any skill or action that requires thought process. While entranced, the person cannot be made to reveal secrets, betray a friend, harm themselves, or act against their alignment. The entranced person’s physical attributes all function at half their normal value (a P.S. of 10 becomes 5, and so on,) and the victim will never remember the actions they made or any events that transpired while entranced. Does not affect people inside power armour, robots, vehicles, or in full, M.D.C. body armour. Shadowmeld (10) Range: Self. Duration: 2 minutes (8 melee rounds) per level. This unique magic enables the caster to slip into the shadows and become totally invisible, even to a See the Invisible spell. The shadow must be at least 5ft tall or long to become an effective hiding place, and it serves as a superior means to remain hidden and move unseen (the caster can walk, run, or otherwise move along the shadow’s length or from shadow to shadow.) While in shadow/darkness, the character moves at 60% Prowl rating (or +15% to their Prowl rating, whichever is higher.) Intense light will dispel the shadow and reveal the caster, though they may flee to another shadow. Feeble light (less than 10 torches or 300 watts) will not generate enough light and simply produce more shadows. While hidden in shadow, the caster is still susceptible to psionic, magic, and physical attacks, but the attacker is at -5 to strike for not being able to see them (area of effect attacks suffer no penalty.) Only infared/thermal vision or imaging is capable of detecting a person concealed by this spell. Summon and Control Canines (50) Range: Varies. Duration: 5 hours per level. Saving Throw: Standard animal. This pentacle of summoning produces 1D4 canines (dog or wolf, +1 additional canine/level) that will obey the will of the summoner, even to their death. While standing within the pentagram, the caster also gains control of any canines within 200ft and line of sight (in addition to the summoned animals, who will obey regardless of if the caster is within the pentagram or not.) Once the duration or the spell is ended (or if the caster steps out of the pentagram in regards to the wild, not summoned canines), the canines will stop, turn, and leave the area. Dog bites inflict 1D6 S.D. and a wolf bite inflicts 2D6 S.D. ; dogs have 2 attacks and wolves have 3 per melee round. Summon and Control Rodents (70) Range: 600 ft. Duration: 5 hours per level. Saving Throw: Standard animal. This pentacle of summoning produces an army of mice and rats that obey the will of the summoner, even to their death. So long as the caster stays within the pentagram, they can maintain control over other rodentia as well (familiars are not affected.) The caster can summon 30 rodents per level. Mouse and rat bites inflict 1 point of S.D. each, mice have 1 attack per round and rats have 2, both are +1 to dodge and have a Climbing skill of 90%. Sustain (12) Range: Self or 2 others by touch. Duration: 24 hours per level. This spell enables the recipient to go days without food, water, or even breathable air by magically keeping their energy levels up so there is no need for an outside source. In addition, the enchanted character can sustain themselves reasonably on only 2 hours of sleep per day and survive in almost any environment. However, the character remains susceptible to other external conditions such as heat, cold, pressure, and physical/psionic/magic damage, as well as fatiguing at the normal rate. Time Slip (20) Range: Self. Duration: Half a melee round (7 seconds.) The caster momentarily suspends time, enabling them to slip 7 seconds into the future. The magic is such that they cannot physically harm anyone, but they can move about their physical environment and manipulate their surroundings (open doors, move objects, flip a switch, etc..) To others, it seems that the caster disappears snd then reappears after a few seconds, any noticable changes happening seemingly instantaneously (the actions remain unseen and the results typically go unnoticed as well.) All those around the caster lose 2 melee actions for that round, though the caster retains all of their melees (these are not used for any actions taken during the stop.) Ideal for a quick escape. Turn Dead (6) Range: Up to 60ft away. Duration: Instant effects. Saving Throw: Standard. The utterance of this incantation immediately turns/repels 1D6 undead per level. This means that those undead affected by the spell stop, turn, and leave the area without harming the caster or anyone else nearby and will not return for 24 hours. This spell only effects animated dead like corpses and skeletons being manipulated like marionettes, it will not effect vampires, zombies, mummies, or any dead creature possessed by a living entity. Mystic Portal (60) Range: 20ft away. Dimensions: 10ft wide by 20ft tall portal/opening. Duration: 1 minute (4 melee rounds) per level. Saving Throw: None. This spell opens a dimensional rift in the fabric of space, allowing the caster to use it in several different ways. This spell cannot be cast on people to be used as a Teleport spell. They must be cast on a vertical, stationary surface. An Impenetrable Wall of Force will stop this portal. Pass Through Solid Walls: The mage has but to weave the spell targetting a specific, blocked area. The area will shimmer brightly and then a portal or passage will appear as if cut out of the very stone. The portal can creat a 12ft deep passage per each level of the spell caster and in any substance. Teleportation: The portal can be a doorway to a nearby location known to the caster, flawlessly traveling hundreds of feet in an instant. The portal can be placed on a vertical wall, the floor, or ceiling. Looking into it reveals what is on the other side while stepping through instantly places the traveler at that location. Range is 100ft per level. The number of people who can pass through depend upon how fast they are moving and how long the mage keeps the portal open (they can close it at will, any time.) An average of 1D6+6 can pass through per melee round. One Way Passage: Once a character steps through the open portal, the opening behind them disappears (though people on the other side of the portal can see both the portal and the person who just stepped through it.) To return, another portal must be created. When the spell duration ends, the portal vanishes, though the mage can close it at any time. A Negate Magic spell will also eliminate the portal if it is successful. Dessicate the Supernatural (50) Range: 1 target up to 50ft away per level, or 2 by touch. Damage: 3D6×10 M.D. (or Hit Points, whichever is appropriate.) Duration: Instant. Saving Throw: -1 to Save against (a successful save results in half damage.) A vicious spell designed for use against supernatural monsters. It will not effect any opponent in full environmental armour (body armour or power armour), or those safely locked inside an M.D.C. vehicle or room; likewise, it will not work against ordinary mortals, human or D-Bee. Only supernatural beings (good or evil), including spirits in the physical form, sub-demons (Gargoyles, Brodkil, etc. ), demons, Deevils, Elementals, Spirits of Light, demigods, godlings, gods, avatars (the life essences of Alien Intelligences, including vampires), angels, and others. It is important to note that the sphinx, Dragons, unicorns, Faerie Folk, and a handful of other superhuman creatures possessing supernatural strength and abilities that are still known as creatures of magic (they are more magical than supernatural, at least not in the same way as demons and gods) are immune to this spell. The spell works by drawing moisture out of the target, killing it in a matter of 2D4 seconds and reducing it to a withered husk. Regenerating creatures will be unable to Bio-Regenerate damage caued by this until they replenish their body’s water supply. Creatures that do not incorporate water in their bodies (i.e., pure energy beings) are not effected. Water Elementals suffer ×2 damage from this spell. D-Step (50) Range: 3ft. Duration: 15 seconds (1 melee round) per level. Saving Throw: None. The mage creates a rip in reality through which they seem to vanish. For a few seconds, the character seems to cease to exist; undetectable by sensors, psionics, or magic! Furthermore, to most everyone else, the dimensional rip doesn’t seem to exist (only Shifters and those versed in Temporal/dimensional magic can see the tear and follow the caster.) Though they cannot be sensed, the caster can still see (not hear, smell, etc.) those in the dimension they just left, as if standing right where they were. Because they have “stepped” to a other dimension, they are immune to damage and effects occuring in the space they just left, including any random dimensional shifts. If two dimensions are linked in such a way that they coexist (such as the Yucatan), they can see and be seen while using this spell, but can also choose to completely enter one dimension or the other. Note: This spell costs half as much and lasts ×2 as long for Temporal Raiders and Temporal Wizards. Rope, chain, etc.) into magical restraints that glow with a mystic force. This enchantment is made to restrain and bind in the same way as M.D.C. handcuffs/manacles/cord would and the subject must already have been subdued and bound with the material. A single captive can be bound at the wrists or ankles (to use both restraints this spell must be cast twice), or in 2 bands around the wrists and torso (pinning the arms to the captive’s body, a chair, tree, etc.) Requires a combined Supernatural P.S. of 45 to break free of the enchanted bonds (and 2D4 minutes of trying to do so), or 100 M.D. to destroy them. The Dispell Magic Barrier and Negate Magic spells will remove the enchantment, but the bonds are at a +2 bonus to save. An Anti-Magic Cloud will dispell them instantly, and Metamorphosis: Mist removes them. Even with the Escape Artist skill, the bonds are difficult to break; reduce the skill by half and using it takes ×3 as long. When bound by this spell, the Escape spell funtions as the Escape Artist skill does at 50% max efficiency, and can only be tried once every 5 minutes. Teleporting while bound will teleport the character, but their bindings will remain enchanted. Metamorphising into an animal or insect with legs is ineffective as they remain bound after transformation. Protection Circle: Simple (45) Range: Radius of the circle. Duration: 24 hours; can be reactivated (only costs 4 P.P.E. to reactivate.) Saving Throw: None. Even as a spell this invocation may be considered a ritual, for it requires the physical drawing of a circle and certain symbols while the spell incantation is recited. Chalk or charcoal (or almost any substance) can be used to draw the circle. Anyone with sufficient P.P.E. and the desire to do so may reactivate the circle after its initial creation. However, if the circle is damage (scuffed, scrapped, rubbed out, cracked, etc. ), the protection is broken and the circle and incantation must be redone. The circle will protect everyone inside its radius by keeping lesser supernatural creatures 5ft away from its outer edge; the beings cannot come any closer, nor enter the circle itself. The protection also grants those within a +2 bonus to Saves Vs. Magic and Psionic Attack. Although lesser supernatural creatures (including lesser demons, Entities, Ghouls, and Gremlins) cannot come near or enter the circle, they can hurl objects, use weapons, or cast spells and psionics against those within. Greater beings (vampires, Elementals, demigods, etc.) are not effected and can enter the circle freely; there is no bonus to Save in regards to these more powerful beings. Sheltering Force (20) Range: Around self or up to 20ft away. Duration: 1 hour per level. Essentially a light forcefield that is a semi opaque (can see shapes, blurred colors, etc., but not details), blueish white dome that almost resembles a plastic tent. The shelter can be small enough to accommodate 2 people or large enough to fit 6 (8 if they’re all crammed together.) It is dry inside and maintains a temperature that is 10° cooler than that outside in warm weather (10° warmer in cold weather), and also keeps rain and insects out; though ‘bots, humans, animals, and spirits can come or go as they please. If attacked, the shelter will only stop 1D6 M.D. per each separate attack, with the remainder of the damage penetrating the shield and possibly hitting those within. The near opaqueness of the shield makes it hard to aim from the outside, and attackers are at a -3 to strike. Summon Shadow Beast (140) Range: Immediate area. Duration: For combat situations, 2 minutes (8 melee rounds) per level. For labour, 3 hours per level. For missions, until the mission is complete. There is a 01-15% chance that the Beast will not return to its home dimension after the duration is up. Saving Throw: None. This inter-dimensional spell summons a creature not of this world to do the summoner’s bidding. Shadow Beasts are large, vicious creatures from a strange world that stand 9 to 12ft tall, with sharp claws and wicked fangs. They are powered by night and darkness, but deadliest of all is their natural ability to completely merge into the smallest of shadows, becoming completely invisible. While hidden in the shadows they are completely undetectable, even to a See the Invisible spell, since they are not truly invisible, but one with the shadows (Deep Vision is the only ability capable of detecting them this way.) The Beast is a born predator who loves to hunt and kill, and so gladly follows orders to do so. Controlling the Beast: In a combat situation, the summoner can control it for 2 minutes (8 melee rounds) per level; after that, the exhilaration of combat allows the Beast to break free of the summoner’s control and either return to its own dimension or stay in ours (if it is having fun, it may even continue to fight. 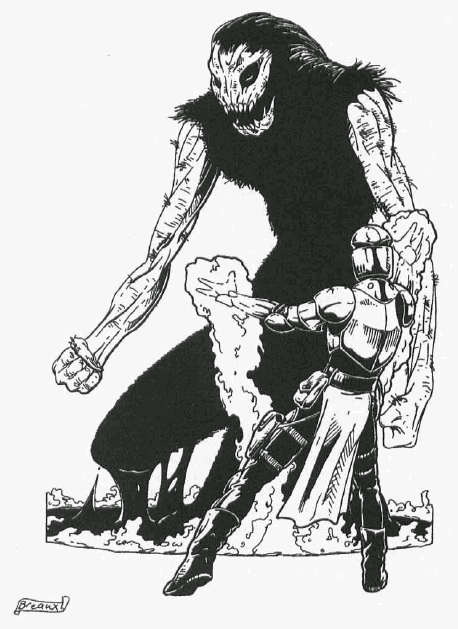 In non combat situations, the summoner can send the monster on simple missions, such as “bring me [item]” or “slay [person]”, and the creature will remain in this dimension until the mission is completed or it is slain. The summoner can also have the Beast perform labour or as a guard for 3 hours per caster level. If the Beast chooses not to return home when the duration laspses (01-15% chance), it is a free agent beyond the control of the summoner that called it. If this happens, it will remain in this world, wreaking havoc and killing innocent people for food and pleasure; likewise, it will attempt to kill anyone who tries to send it back. *I.Q. 7, M.A. 7, M.E. 7, P.S. 30 (Supernatural), P.P. 24, P.E. 30, P.B. 3, Spd 24. *Damage: 5D6 S.D. for a restrained punch, 3D6 M.D. for a regular punch, 4D6+2 M.D. for a slashing or stabbing claw strike, 6D6 for a power punch (counts as 2 attacks), and 3D6+3 S.D. from a bite. *Combat: 6 attacks, +2 initiative, +3 strike, +4 dodge/parry/disarm, +8 Save Vs. Horror Factor. *Impervious to cold, heat, disease, and poison. Regenerates damage at a rate of 2D6 M.D.C. per round. *Invisible and undetectable, even to tech sensors and optics. *Skills of Note: Prowl 90%, Climb 80%/75%, Land Navigation 60%, Wilderness Survival 80%, Track 40%, and can comprehend the language of the summoner and Dragonese. *I.Q. 7, M.A. 7, M.E. 7, P.S. 18 (not Supernatural), P.P. 16, P.E. 15, P.B. 3, Spd 8. *Combat: 2 attacks, +1 initiative, +1 strike, +2 dodge/parry/disarm, +4 Save Vs. Horror Factor. *Impervious to cold, heat, disease, and poison. Can not regwnerate damage until in shadow or at night fall. *Completely visible and detectable by sight and sensors! *Skills of Note: Prowl 45%, Climb 40%/37%, Land Navigation 30%, Wilderness Survival 40%, Track 20%, and can comprehend the language of the summoner and Dragonese. Armour Bizarre (15) Range: Self or 1 other up to 30ft away. Duration: 1 minute (4 melee rounds) per caster level. M.D.C. Protection: 15 M.D.C. per caster level. Saving Throw: To Save Vs. Horror Factor only. Creates a suit of a magical, form-fitting force that serves as armour. This armour appears to be composed of dozens/hundreds of writhing tentacles, pulsating slime, or crawling worms. This magical illusion provides a Horror Factor of 9 at 1st level, +1 for every 2 levels of the spell caster (a Horror Factor of 10 at 2nd level, 11 at 4th level, etc.) Anyone fighting an opponent in this armour is automatically distracted by the moving parts (-1 to initiative) and must make a Save Vs. Horror Factor at the beginning of every melee round; a failed save results in the usual Horror Factor penalties. Heavy Breathing (5) Range: 60ft, sound can be heard in a 6ft radius. Duration: 75 seconds (5 melee rounds) per level. Saving Throw: Standard; those who successfully save are not affected/fearful. The mage is able to conjure a mysterious, frightful sound of heavy, laboured breathing – as though something invisible were lurking about. They can mentally manipulate the sound, increasing or decreasing the breathing rhythm, or move the sound around up to 60ft away. Those hearing the breathing are likely to become fearful and panicky; there is a 01-60% chance that a frightened person will flee in terror. Those who hear the breathing but do not run are at a -2 to strike and a -1 to parry/dodge, as they are shaking in their boots. Lifesource (2 – special) Range: Self. Duration: Instant. Cost: 2 P.P.E. initially, plus siphoned S.D.C. or H.P. exchange. By using this spell, the mage is able to convert their own life energy (H.P. or S.D.C.) into P.P.E. points for casting spells. Casting this spell costs 2 P.P.E. and inflicts physical pain and weakeness upon the caster; the sacrifice of portions of their life energy racks the body with sharp pains and invisible physical damage. Obviously, this is a spell of desperation. In game terms, the willing sacrifice of 2 S.D.C. results in 1 P.P.E. point gained; the sacrifice of 1 H.P. results in 1 P.P.E. as an equal exhange. The mage can accidentally kill themselves using this ability by reducing their H.P. to 0 (even if they have remaining S.D.C. available.) If their H.P. is reduced to 0 inthis fashion, the character slips into a coma and is -20% to Save Vs. Coma/Death! Furthermore, for every 10 S.D.C. or 5 H.P. the mage exchanges, they become weak and are -2 to all rolls for combat/saving throws, -2 to all combat bonuses, and -10% on skill performance. At some point in using this spell, the character can do little more than lie in a heap mumbling to cast spells – too weak and injured to move! Note: This damage resists both bio-regeneration and magic healing, but is not permanent and will heal at the normal rate for the character. Horrific Illusion (10) Range: 30ft. Duration: 2 minutes (8 melee rounds) per level. Saving Throw: Save Vs. Horror Factor 14. 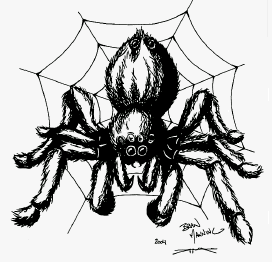 The caster creates a frightening, illusionary image of a horrible sight using common images, such as 100 large (presumably poisonous) spiders or other bugs or snakes, or vicious, rabid animals, or fire, and similar. A failed saving throw means that the character is momentarily stunned, with the usual Horror Factor combat penalties applicable for that 1 melee round. However, the illusion is so real that any characters that fail to save will not challenge or go past it, but may attempt to find an alternate route around it. Weight of Duty (10) Range: 1 victim up to 200ft away, or 2 by touch. Duration: 1 minute (4 melee rounds) per level. Saving Throw: Standard Save Vs. Magic (no bonuses from high M.E. or other mental bonuses apply.) The spell only effects intelligent, mortal beings of an honorable alignment (including Aberrant) or a strong sense of duty and responsibility; Supernatural beings and creatures of magic are immune. Failed Save: The victims suffer the feeling that the task set before them is too great and they are doomed to failure. This magical melancholy makes them lose all inspiration, drive, and initiative; their limbs actually seem to feel heavy, like they are straining to lift an enormous weight. Those affected suffer the following penalties: No initiative, -1 attack per melee, -4 to strike/parry/dodge, speed and skill performance is halved, plus skills and actions are done halfheartedly and take twice as long. They are also likely to surrender if things go badly. Successful Save: The target benefits from renewed determination and they recieve a +2 bonus to initiative and a +2 bonus to save vs. this spell and all similar mind control magic used on them within the next hour! Apparition (20) Range: 30ft. Duration: 1 minute (4 melee rounds) per level. Saving Throw: Standard Save Vs. Magic. The wizard can create a realistic ilusion in the form of a horrible creature or weird thing that will attack all who come within 20ft of it. Apparitions are commonly used to block or guard passages. Although an illusion, it will appear to be completely real and interact with an opponent’s actions; it will appear to sweat and bleed, but cannot be killed or stopped. The illusion can appear as any known supernatural creature or an imaginary “thing”, like a man-eating refrigerator and so on. Anyone who sees it imagines it to be very real and even imagines it doing damage to them – none of the damage dealt by the apparition is real, though any other damage is (falling damage, other combatants, friendly fire, etc.). Combat should be conducted as usual, though any damage is imaginary and disappears when the apparition does. Should the opponent of the apparition “die” during combat, they fall unconscious for 2D4 minutes from shock; the experience is traumatic, a Save Vs. Insanity must be rolled (12 or higher is successful), if unsuccessful, roll under the Random Insanity Table on page 332 of RUE. Dispelling the Illusion: There are three ways: 1.) A successful Save Vs. Magic dispells the illusion only for the successful character, all others who failed are still affected. 2.) Plunge a rod or something made of iron into it. 3.) Wait for the spell duration time to elapse. Giant Amazon Spider: Jellybean Unlike conventional spiders that spin webs and wait for their prey, these giant beasts stalk theirs, hunt in packs, and are so smart that they use rudimentary tactics (ambush, fienting, decoys, etc..) Their physiology is different, too; they are warm blooded, bear live young (100 at a time), and have 8 eyes of varying color that each see different spectrums (6 on its head, 2 on its abdomen by its spinneretes.) This particular creature has soft, black and brown fur and is only close to her master, she likes to be stroked and introduced, and to ride on her master’s back or shoulders. She shares her master’s meals or hunts for herself. Alignment: Miscreant, tries to match master’s alignment. Instinct/Skill Equivalent: Climb 95%/90%, Prowl 65%, Swim 30%, Camouflage 65%, Detect Ambush 70%, Detect Concealment 75%, Fishing 70%, Land Navigation 75%, Track Prey 60% (animals/humanoids, +5% strong/blood scents), Spelunking 80%, Lore: Cattle and Animals 50%, Language: Gobblely 50%, Language: American 50%. Skills do not improve with experience. Combat Bonuses: 5 attacks per round, +4 initiative, +2 strike/parry/roll, +3 dodge/entangle, +1 disarm, +5 Save Vs. Horror Factor, and a critical strike on a natural roll of 19-20. Attacks/Damage: Front Leg Swat/Punch: 1D6+9 S.D. Power Front Leg Swat/Punch: 1 M.D.+9 S.D. (costs 2 attacks) Mandible Bite: 3D6 S.D., no applicable P.S. bonus. Habitat: Giant Amazon Spiders are originally from a tropical forest in another dimension, but they acclimated easily to the Rifts Earth Amazon Rainforest and some are rumoured to live in the dense forests of Ohio and Southern Michigan. Size: 23ft long, 2ft wide, 1ft tall, 32 lbs. Not applicable. Though Septumbrans are indifferent about augmentation, a mage will generally avoid implants as they interfere with their spell casting. Description: His eyes are yellow and his fur is an unusual grey with large white patches covering his whole face, hands, feet, and the end of his tail. He proudly displays the bloodstains from his sacrifices and other horrors on his muzzle, neck, and hands – in fact, sometimes he bears the blood of his kills for days before washing it off. Like all Septumbrans, he has a furry, seprentine tail that is as long as his body is tall, which he keeps mostly uncovered to use during combat or to trip people. He does not wear much in the way of armour, just a patchwork set that only covers a little of his body. His most typical garb is a black trench coat with the arms ripped off, heavily stained with blood, and his hundred rag skirt, which reaches mid calf and is composed of varyingcolours and cloths, even some treated skin from his victims. He wears a leather pouch around his neck, which is strung beside teeth of different races. More often than not, you will only catch a small glimpse of his visage, and rarely is there anyone alive that can describe him very well at all. Insanity(s): Phobia: Cats (and beings who resemble them), Phobia: Being mind controlled or possesed, Obsession: Demon Lord Manohshek (near the point of worship, monthly [or more often opportunistic] sacrifices in their name, etc.). Sentiments Toward D-Bees: Indifferent, so long as they are not more powerful than he is they make worthy sacrifices, and though some don’t taste very good, he believes he may be granted their powers if he sacrifices and devours enough of them. They sometimes pose a delightful challenge. Sentiments Toward Humans: Delicious. Humans are a delight to stalk and take as sacrifice because he finds their panicked reactions to be amusing. Otherwise, he finds them detestably pathetic. Bad Reputation This is well-earned by the naturally evil Witch Wolves, and as they resemble a cross between a wolf and a demon (which isn’t far off), they are often attacked on sight. Allegiance with Supernatural creatures and demons has earned them this fearsome reputation for being evil monsters themselves, they are feared and never trusted. They are typically headstrong and aggressive; they often bite off more than they can chew. Low Physical Beauty Face is so scarred, deformed, frightening or ugly by Human standards that the character suffers penalties of -5% to skills like Gambling, Intelligence Gathering, Performance, Public Speaking, and Undercover Ops, -20% to the Seduction skill, and a +5% bonus to the Intimidate skill. Any penalties are included in the total percentage in the skills sections. Background: Born of a small family of Witch Wolves, mostly Shifters who weren’t at all inclined to do good, he picked up on dimensional and summoning magic easily from his Father, Goyle, and other family members. 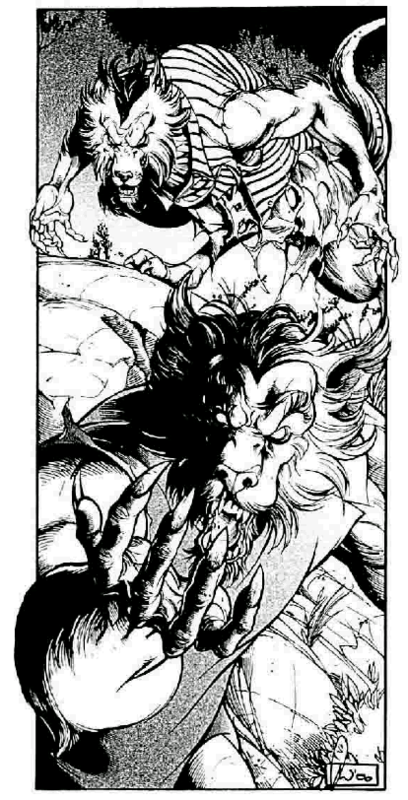 As he aged and grew in power and abilities, his Father recognized that strength by introducing him to the Demon Lord Manohshek, whom his elder family served through sacrifice – Ethan performed his first sacrifice and ate his first heart that day, an elderly human woodcutter. A few years passed and his family broke away into different territories, an attempt to stave off their own extinction from growing too powerful and earning a bounty; he and Goyle decided to stick together so he could train further in Shifter abilities. One day, Goyle communicated with Manohshek during a ritual sacrifice and was ordered to do the same to his teenage son, to devour his heart and steal his power. Goyle was only too happy to do so, and caught Ethan in a trance, using mind control to hold him in place for sacrifice. Ethan had successfully saved against this control, however, and imitated what he’d seen their victims do countless times to fool his Father until he was able to strike. He killed his Father at their altar to the Demon Lord, and Manoshek praised him, encouraging him to devour Goyles heart and other organs in exchange for a link of power. Ethan, who quickly became known as the urban legend “Whitehowl” for his unusual, ghostly fur color, never knew that Manohshek had called for his sacrifice, and grew obsessed with his grisly duty to kill and devour in their name. He revels in scaring travelers, not always killing or eating them, and very much enjoys being a “ghost of the wood” in an area where Septumbrans aren’t even heard of. Family Tree: Father was Goyle Crowley (now deceased.) Mother was Akela (deceased after a failed battle of wills with a greater demon.) No siblings, and he isn’t in contact with other family members in different territories – doesn’t trust them. Arms: Javelin 2D6 S.D.. Submachine-Gun 4D6 S.D. per single round or 1D4×10 per 3 shot burst, 500ft, silver ammo. Patchwork Armour Covers 30% of the body, 36 M.D.C.. Abilities: Horror Factor 13, Nightvision 600ft, Deep Vision, prehensile tail, excellent sense of smell, Bio-Regeneration (Hit Points at a rate of 1D4 per hour, and S.D.C. at a rate of 1D6 per hour), recovers P.P.E. at a rate of 5 points per hour of sleep or rest or 10 points per hour of meditation, Dimension Sense 62%, Sense Rifts within 150 miles, Familiar Link, Summoning, Link to the Supernatural with the Demon Lord known as Manohshek the Devourer. Spells: Tongues (10), Turn Dead (6), Time Slip (20), Sustain (12), Summon and Control Rodents (70), Summon and Control Canines (50), Shadowmeld (10), Trance (10), Sense Magic (4), Sense Evil (2), Re-Open Gateway (180), Repell Animals (7), Exorcism (30), Energy Field (10), Energy Bolt (5), Dimensional Portal (1000), Contain Being (20), Compulsion (20), Call Lightning (15), Calling (8), Sheltering Force (20), Protection Circle: Superior (300), Protection Circle: Simple (45), Forcebonds (25), D-Step (50), Dessicate the Supernatural (50), Mystic Portal (60), Apparition (20), Weight of Duty (10), Horrific Illusion (10), Lifesource (2 – special), Heavy Breathing (5), Armour Bizarre (15), Summon Shadow Beast (140), Banishment (65), Dimesional Teleport Home (75), Communication Rift (50+), Dimensional Travel (125+). This entry was posted in Character Creation, High Level, RIFTS RPG, Role Playing, Toon Tuesday and tagged high level villain, Palladium Books, rifts NPC, Rifts RPG, Septumbran Witch Wolf, shifter occ, toon tuesday. Bookmark the permalink.